French Canadian Julian Rose is a master chocolatier and the director of research and development for Portland’s Moonstruck Chocolates. From his earliest days in his parents’ pastry shop, through a professional career of more than 25 years, Rose has made his life’s mission to crack the subtle secrets of chocolate. 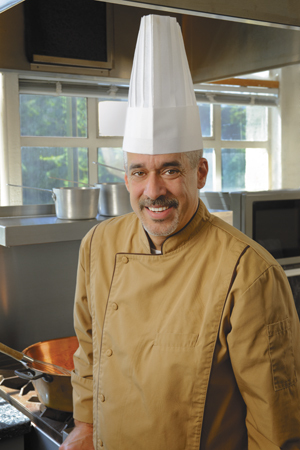 He is classically trained both in pastry and confections and is a highly regarded authority on chocolate — Dessert Professional magazine recently named him one of the top ten chocolatiers in North America. At Moonstruck, he is responsible for developing new products, refining existing ones and ensuring the product line is of the utmost quality. Prior to joining Moonstruck, Rose worked for a large European chocolate maker, instructing some of the world’s top chocolatiers and confectioners how to best work with chocolate. Q: How did you get into chocolate professionally? JR: I got into chocolate and pastry very early in life. My parents owned and operated a bakery and pastry shop just outside Montreal when I was a very young boy. This is the only thing I remember ever loving. Making cookies when I was five or six and helping out at the bakery. My Dad was European and this is how life was for a bakery owner in Europe, and it works well. We were always together and having fun as a family. Work and play was kind of a blur. After graduating high school, I went to the best hotelier and bakery school in Quebec and graduated best in class. Followed by work in a few top restaurants in Montreal and then went to Europe to perfect my apprentice training. I came back to run the family business with my brother and took the pastry segment to the next level. I then opened a chocolate bonbon segment that did very well. It drew attention to my flavors and quality to the point where I was hired to teach chocolate and confectionery by the best chocolate producer in the world. I did that for eight years and started a consulting business. That’s how I got in contact with Moonstruck. Q: What is the key to great chocolate? JR: The key is high-quality beans, high-precision manufacturing for a perfect flavor and repeatability; this is something often ignored. If I can make it taste great one time, can I do it again 100 times? For that reason, we have a few custom chocolate recipes that I created and I leave the job of “making the chocolate” to the expert chocolate makers in Europe and North America. Being consistent is my No. 1 priority. And we need to remember that everyone loves the chocolate that they love, there is no discussion if I try to push a very dark chocolate with a high percentage of cacao to someone who loves milk chocolate … you love what you love. The chocolatier is a magician to make those dreams come true. Q: What is the most unusual flavor you have tried with making chocolate? JR: One of the most unusual flavors was when I was in Brazil. We tasted so many fruits and vegetables that we have never seen here. And one of them was cashew apple. The cashew apple is the red fruit where the cashew nut is attached at the base. In the U.S., we only get to taste and enjoy the cashew nut, but not the fruit of the cashew tree. I had a friend send me some juice and also rare nuts from the Amazon forest. They were amazing but so hard to get that I only made a very small amount just for friends … I think there are very few limits with chocolate. It can actually work well with savory and sweet, or spicy or acidic, even fish or scallops with white chocolate if you do it well! Q: Where do you find your flavor inspirations? JR: I find inspiration in everything I experience. From travel to culture to architecture, and ethnic flavors and traditions. Since the world is getting smaller with the Internet, having an open mind to influences from around the world is awesome. The key is to adapt the flavors or trends to our reality here in North America. Flavor trends are something different. That is mainly driven by consumers wanting the “latest thing.” Unfortunately, that’s not always inspiring…but I think it pushes forward innovation to new combinations. Q: What was your favorite candy/chocolate as a kid? Q: I see Moonstruck has a distiller’s series and craft brew truffles. Any plans for wine on that menu? JR: Hmmmm … you must have a hidden camera in my test kitchen. I have been working for the past year on a fabulous concept for our wine truffle. It is getting close to completion. It will be with Oregon and Northwest wineries at first, but we have big plans to expand that into a full line of wine truffles. Stay tuned, and I’d love to have you over and pick your brain and have you preview those bonbons soon. It will be something very different from anything out there.